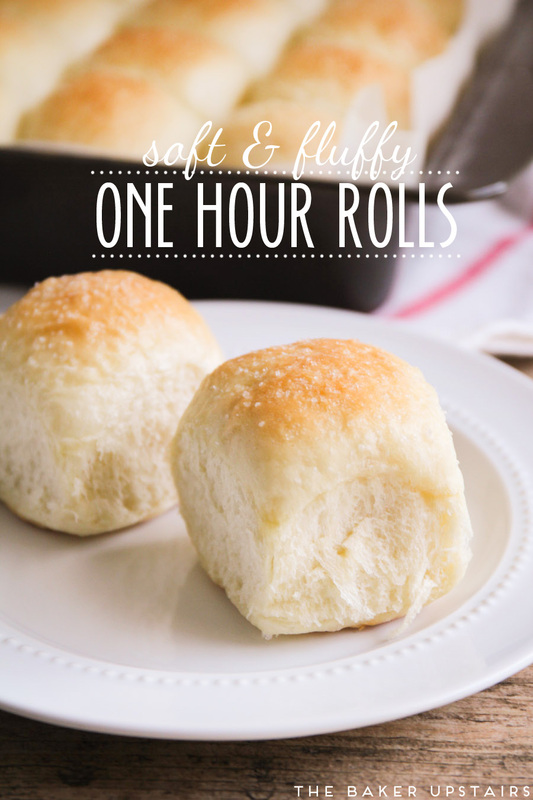 Soft and fluffy one hour rolls - you will not believe that these fantastic rolls take only an hour to make! It's no secret that I love bread. But what I don't love about it is waiting for it! I was talking with a new friend a few months ago about baking, and he mentioned that at minimum, his bread recipes take 24-36 hours. He's an amazing, restaurant-worthy baker (far more advanced in his baking skills than I will ever be) but all I could think was, "How in the world could anyone wait that long for some delicious bread?" When I want bread, I want it now! 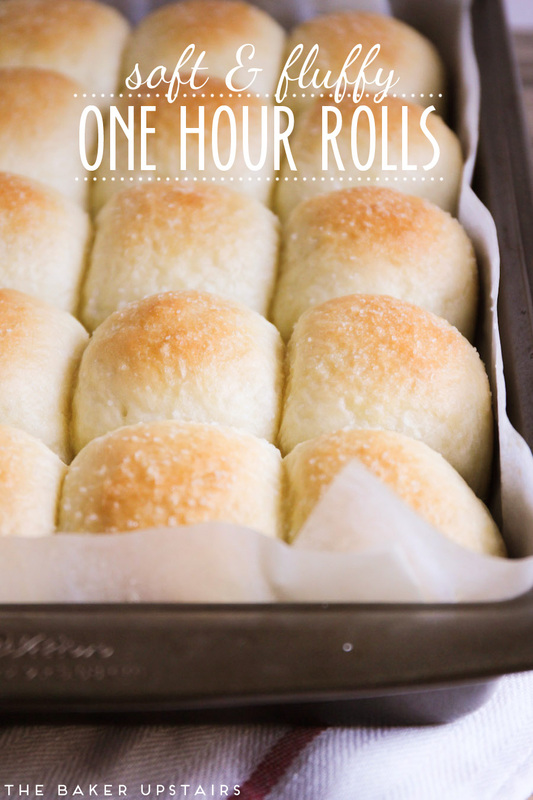 I've resigned myself to the fact that I have to wait 2-3 hours for some fresh bread, but then I discovered this recipe for soft and fluffy one hour rolls. Mind blown! I've been burned by one hour roll recipes before that turned out dense and chewy or just didn't taste right. 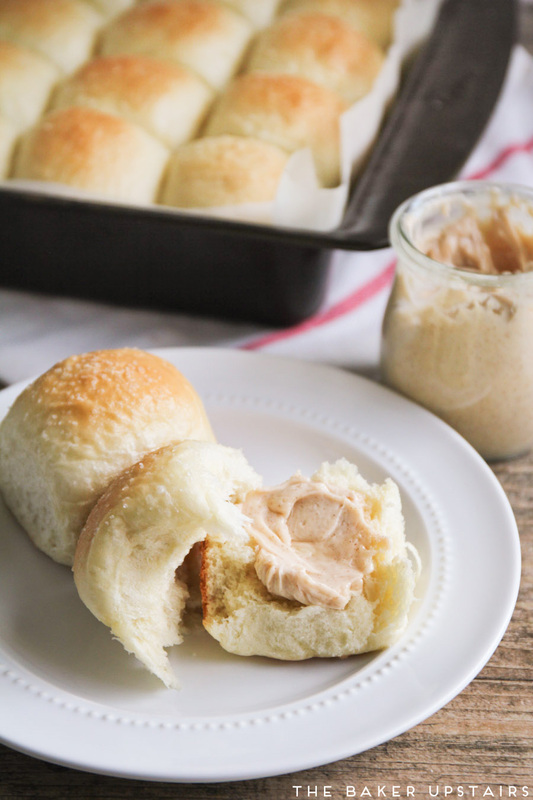 These rolls, though... they taste like they took all afternoon to make! They're light and fluffy and so soft and delicious. I made a pan of twenty rolls and they were gone in an afternoon, between the four of us. They are honestly some of the best rolls I've ever made, and I can't believe they only take an hour to make! I served them with some amazing cinnamon vanilla honey butter (recipe coming on Friday!) and they were pretty much the greatest thing ever. You definitely need this little beauties in your life, and fast! Preheat the oven to 400 and line a 9 x 13 pan with parchment paper or spray with cooking spray. Gently punch the dough down and divide into 20 equal sized pieces (I used a kitchen scale because I'm neurotic, but I'm sure they would work out fine if you just eyeballed it). Roll each piece into a ball and space evenly in the prepared pan. Brush with melted butter, sprinkle with sea salt, and let rise for an additional 15-20 minutes. Bake 13-15 minutes, or until golden brown. Remove and brush with butter. Let cool slightly before serving and enjoy! Do you use all-purpose flour, or bread flour? Can you make these but then refrigerate till morning? would whole wheat flour work? I can't say for sure, because I haven't tried it, but it seems like it would work. It's usually not a one to one substitution, so I would start with less of the whole wheat flour and add just enough to form a dough that's not too sticky. They also might not be as light or rise as much. I made these today and substituted 1/3 of the flour with whole wheat flour. I ended up with wonderful light wheat rolls. Made these today since I was snowed in and was looking for something to go with the soup I made. They are delicious! Quick and easy too. They smelled so good baking in the oven I couldn't wait to eat them! This will be my go to recipe for rolls from now on. I'm so glad you liked them! I can't wait to try them!! They look easy enough for me! Thanks so much for sharing! Is this rapid rise yeast? I used active dry yeast. So glad they worked out for you! How long do these keep without starting to get hard? I'd love to make them for a dinner party, but my oven will be occupied for several hours before guests arrive. Can they be made a day ahead? Thanks! Can I make them this afternoon and have them still taste as good tomorrow for Easter dinner?? I'm traveling with them, so I'd like to make them this af or tonight. OR, could I just make the dough and keep them in the fridge until tomorrow to bake? Thanks! I've made other one-hour rolls that turned out more like biscuits- these were perfect! Just like the par-baked dinner rolls at the store, but better! Thank you for the recipe. My boyfriend says these are the best rolls he's ever had. I have to agree. They're my new go-to for dinner rolls. The way it is written I need to clarify, is it 1/2 c. Warm water or 1 1/2 c. Warm water? I can´t wait to try them!!! They look easy to do! May I made the dough in a bread machine ? Thanks, tbey looks so good! I don't own a bread machine, so I couldn't say for sure. They have a much shorter than usual rise time, so I am not sure if it would work. Let me know how it turns out! Made these last night. I used instant yeast because that is always what I have on hand and I substituted olive oil in place of the butter in the dough because I was too lazy to deal with the two pound block I had in the fridge. They were delicious, I'll definitely make them again when I decide at the last minute that I want fresh bread with dinner. Thanks for sharing the recipe. Olive oil sounds great! I will definitely try it that way next time (although I do love butter). Thanks for sharing! Hi is 1cup equal to 4oz or 8 oz? It depends on what you're measuring. For water (or other liquids) 1 cup = 8 ounces. If you're measuring flour, 1 cup is a measure of volume, not weight. How much olive oil did u use? I would recommend using 2 tablespoons. I've made 3 batches of these within the last week. They are amazing. Thank you for sharing. If I don"t have a stand mixer, could I achieve the same results with a hand mixer? I think it would depend on how powerful your hand mixer is. I would definitely use the dough hook attachment and see how it goes. You may need to do some kneading by hand. These were super easy to make and tasted amazing! I will definitely be making them again. Thank you for the great recipe. Do you use salted butter or unsalted butter? I'm assuming unsalted. :) thanks! I always use salted (because I'm a rebel) but either will work. These turned out absolutely beautiful! Mine are rising as I type this out, was thrilled to see you make bierocks and wanted to know if you've tried this recipe with those yet? I always cheat and use frozen Rhodes dinner rolls. These seem to be easy enough I may do homemade next time we make bierocks. Can I make these all by hand. I have not tried this one yet, but generally, I have dound that freezing bread works out really well. I make all kinds of bread for my 2 boys and if it is a loaf, I freeze them in half-loaves so that I know I can use up the portion before it goea hard. For rolls, I just freeze them all and pull out the number I need the night before (for packing lunches) or the morning of for bread with dinner. Hope this helps! I haven't tried it yet, but honestly if you have time to make rolls in advance and freeze them, I would recommend making a real roll recipe (like this one: http://www.thebakerupstairs.com/2013/07/perfect-crescent-rolls.html). The yeast makes them rise. Just curious why is sugar added? It provides food for the yeast (to help it rise fast) and also adds a little flavor. If persons are allergic to yeast, can Baking Powder be used a substitute? I'm confused? I thought in order for it to be gluten-free you could not use all purpose flour. I have guests coming in a month who require gluten-free for health reasons. Help! These are definitely not gluten free. I don't generally cook gluten free, so I couldn't even tell you what to substitute. To make a gluten free version you will have to substitute a gluten free flour for the all purpose flour called for in the recipe. You also want to check the yeast you use for gluten. Bob's Red Mill (I think that's the name) makes a gluten free all purpose flour blend that may work. I would be sure to try a batch beforehand. i see this was originally posted over a year ago, but i couldn't resist in commenting. you are not alone in being neurotic about using a kitchen scale :) i'm just glad i'm not alone and that you're admitting it online!! hehe....i weigh everything i can that is portioned out....do you? I really enjoy baking all kinds of breads. I baked these rolls this afternoon and they are very tasty and fluffy. I'm one who eyeballs the pieces of dough instead of using a scale and I ended up with 18 rolls in a 9 x 13 pan. They turned out great! I think that these rolls will be made fairly regularly at my home. Thanks for the recipe! So can I add some honey to them to make them a little sweeter? They have a good amount of sweetness as is, but I'm sure some honey would be delicious! Do you knead by hand or using the mixer? I used my mixer, but you could easily knead them by hand too. Thanks, Young baker, for asking about kneading by hand or mixer. I usually choose artisan no-knead bread recipes because I have no kneading experience. I did recently get a mixer and was hoping the mixer could do the kneading. 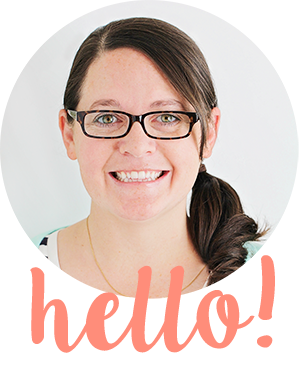 Thanks, Alicia, for answering and sharing this recipe. Thinking this'll be my recipe for Thanksgiving bread. Can I refrigerate overnight before the second rise. Then take them out the next day for 20 min and then bake? I made a one hour roll recipe yesterday that I was not impressed with. Not your but fairly similar but it called for 2 tablespoons on yeast and 3 cups of flour. They wouldn't rise I literally had to let them sit for like an hour and half. Is it possible that maybe it was to much yeast? I'm definitely gonna try your recipe! Always check the expiration date on the yeast. Also, be sure the water is warm enough or it will not activate the yeast. Too warm,the yeast will die and not rise properly. It should take no longer than 5 minutes to start smelling the yeast and bubbles to develop, which is "proofing" to see if yeast is alive. All I have to say is Wow! These are very awesome. I made a batch for dinner and they were all gone. These taste just like a roll I make that takes 3 hours or more. I will make these for now on. Thank you for sharing this recipe. I made these today but they did not turn out the best. The taste was good but to heavy. I dont know if that is because the bottom was to dark from me putting butter on the bottom or was ot to much flour. Another thing os I used salted butter so i did not need the salt on top of the bread. Oh and my yeast package expired September 2017. So im going to give this another shot. I think if I turn my oven down lose less flour not salt on top I may have a winner. Thanks Alicia! I made them this morning and they are nice! How far do these need to be spaced apart? Looks amazing btw! Do you think I could make these without the sugar? We don't care for breads to have a sweet flavor. 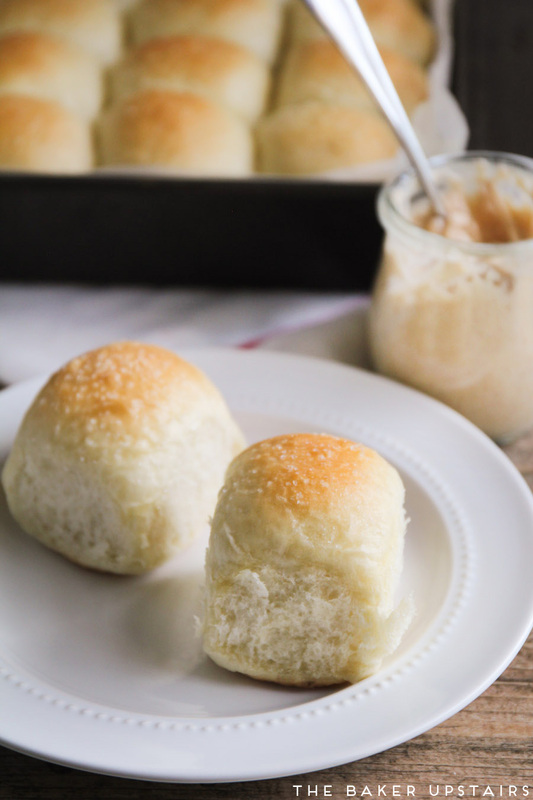 The sugar doesn't add much sweetness to these rolls, but is needed to feed the yeast. You could cut it back by half, just enough for the yeast but no added sweetness. How much did you weigh out each roll to be? I just made these for my Christmas Celebration, let's just say, they were the hit over my brisket, pan seared green beans and stuffed potatoes, I am so happy they came out so well, thank you so much for this recipe, so easy!!!! and absolutely delicious! This recipe is fantastic!! Super quick and delicious! I was very skeptical to be honest but when we sat down to Christmas dinner (I volunteered myself to bring rolls from scratch and then almost wasn't going to do it due to being worn out from toddler Christmas morning mayhem and then I found this quick recipe) took bite and they were soft and buttery and really great. 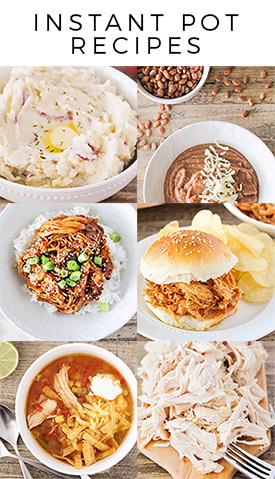 This will be my go to "rolls with dinner" recipe! Thank you so much!! I tried your recipe with a little twist. I filled them with flavored boiled and mashed potatoes. The bread was extremely good, i fell a little short on the spices in the filling. When eaten insode the bread they were slightly bland, i can take cate of that next time. Also with the filling i would have added a tad bit of more sugar so that the sweetness of bread can be felt. By the way these tasted quite nice even after 2 days. Just a 10 sec reheat in the microwave worked. I used them as a tea time snack. Hello. I'm a beginning yeast baker. I couldn't quite form my dough, which I had quartered then cut in wedges, into nice balls. Any tips? I rolled my wedges into crescent till shapes, and they came out fine, just not as pretty as yours! I tried this today and the rolls turned out so beautiful! So soft and tasty. I am so happy I found this. I will definitely keep this recipe and bake these tools over and over again! May stuff them the next time around :) thanks so much! Omgoodness!.I made these tonight to go along with Homemade Potato soup. These were the softest, most moist, delicious rolls ever. Thank you for sharing. And they just lift out of pan like feather..A Keeper!!! These are a new favorite in my house! So easy and delicious and my 4 yr old loved helping roll the dough into balls and put them in the pan! 1) Do you think I could make these on a cookie sheet instead of a closed pan? 2) Do these keep for a day? Would like to make the day before Thanksgiving but don't want them to be hard by the next day. I'm sure they would work fine on a cookie sheet. In my opinion, they're best the day that they are made. OMG!!!! These turned out A-M-A-Z-I-N-G! At first i didn't think the first rise was rising proper, but after punching it down the dough felt just fine. I couldn't contain my excitement watching them rise in the oven, with my husband laughing at me through the whole process. Love these!!!! Made these for Thanksgiving. Now it's the only rolls my family wants. Thanks for the recipe. So these do not use eggs?? Awesome! So glad you liked them! Omg these are so yummy.I made them and my kids and hubby went crazy.thank you for sharing . Thank you for this recipe. It's just wonderfully easy to make. I mixed some butter oregano and garlic mix on top before putting them in the oven which gave me a wonderful crust on top. Will definitely be making this again, soon! If using a kitchen scale what is the weight for each roll? It will depend on how much flour you added and your altitude/humidity. I just weigh the whole ball of dough, divide that weight by 20, and make each of my balls that weight. Do any of you know how this recipe can be made into a loaf of bread instead of rolls? I made the rolls and they are wonderful. Delicious - I made these for Christmas dinner last night and they were super tasty. They did turn out a little dense because I think as you warned, I used a little too much flour :) Will keep this recipe and try again with less flour and see if I can make mine turn out as pretty as yours! Thanks! I've always been intimidated by making bread, but I tried your recipe. The rolls turned out so great! I will be making it many, many times in the years to come. I used half whole wheat flour (I'm always trying to add nutrition where ever I can. ), and it was delicious. Thanks so much!! I used olive oil instead of butter. Plus i put ham and cheese on top. Just made these and they turned out so beautifully!!!! I'm so excited and delighted. My sister is going to fresh out with excitement. Thank you for this excellent recipe!!! I needed rolls to have with spaghetti I made but didn’t want to go out in the rain to get. I ended up going because I didn’t think my yeast was working. When I got home it looked foamy so I went ahead and made them. Yummy! Will be using these instead of the store bought rolls. They did take about 25 minutes in the oven but that could very well be my old oven. Thank you immensely for sharing your recipe.